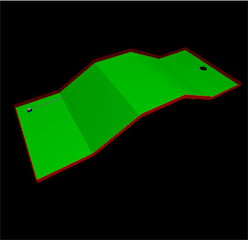 3D Minigolf is a small minigolf game based on a simple 3D engine done in C++ and OpenGL. 3D Minigolf is a hobby project I have done to develop my C++ programming and 3D graphics skills. The project has been based on some assignments from a Game Engine Programming course at my university. The project is not completely finished as the minigolf game is for example missing a start menu, a high score list, minor tweaks and the ability to choose how many players there should be in the game. The minigolf game contains 18 levels, which are all read from a simple text file. Please find below the source code for the game which should be able to be compiled using OpenGL libraries to create an executable file.